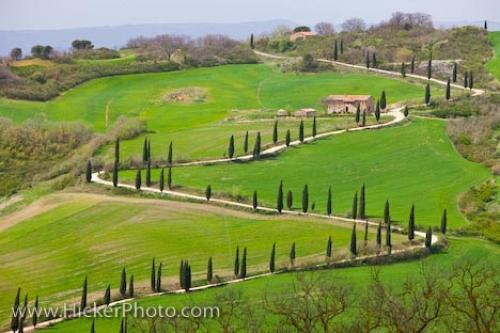 A road winds its way across the Tuscany landscape in La Foce, Province of Siena in Italy, Europe with tall Cypress trees bordering the edges. Beautiful manicured landscape in the Province of Siena in the Region of Tuscany in Italy, Europe is bordered by an assortment of trees and plant life. Alongside the road which zigzags its way across the lush green landscape, Cypress trees flourish as the road heads over the hill to places unknown. Zigzagging road lined by Cypress trees, La Foce in the Tuscany landscape, Province of Siena, Region of Tuscany, Italy, Europe. Photo of the lush green landscape of Tuscany in the Province of Siena in the Region of Tuscany in Italy, Europe.